Helena at the start of the summer spent some time at her grandmother's house. When we picked her up, she was more than proud to show off the pile of Tintin books she'd read. She had to tell me all about them. And at that moment we resolved to work our way through the lot of them (in French). We borrowed a few volumes from my mother-in-law and set off. Helena was reading them in a somewhat haphazard order, but I decided to start at the beginning: Tintin au Congo. Every time I settled down to read Tintin, Helena would join me. This meant she would want to tell me what happened, tell me all her favourite parts; even better, she would want to read it aloud to me, and so we'd have to start again from the beginning. We made several such starts on several rainy evenings. Progress was slow. On the up side, Helena's French vocabulary and pronunciation is much better than mine, so it was quite a boon to have her by my side. I managed to finish the book before summer's end by "sneaking" a page or two at a time after Helena's bedtime. Tintin's never held any particular appeal for me, but there's no denying he's well loved by a great number of people the world over. 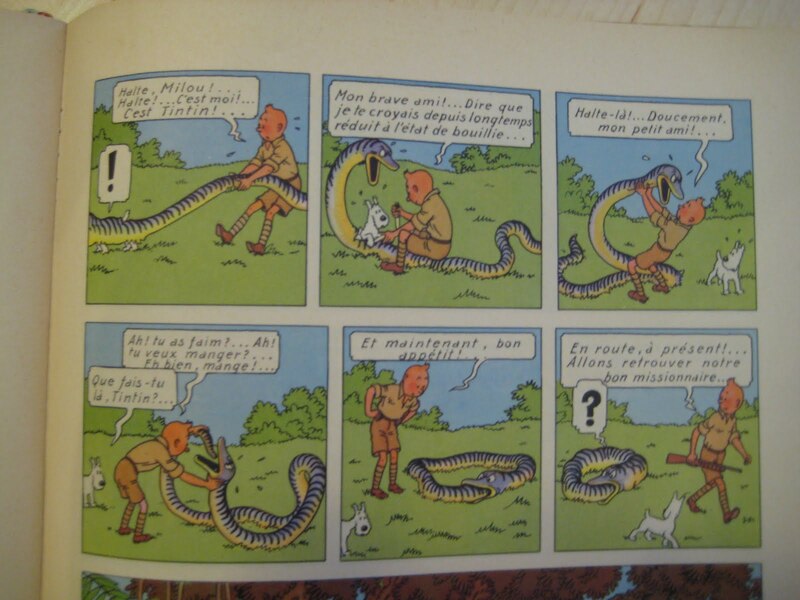 The plot of Tintin au Congo wanders all over, but there's a great sense of adventure and it's much funnier than I expected it to be, in a gentle kind of way. I fully intend to read them all, eventually, if only to know what it is my daughter's talking about. But thank you, Tintin, for turning my daughter into something of a reader. 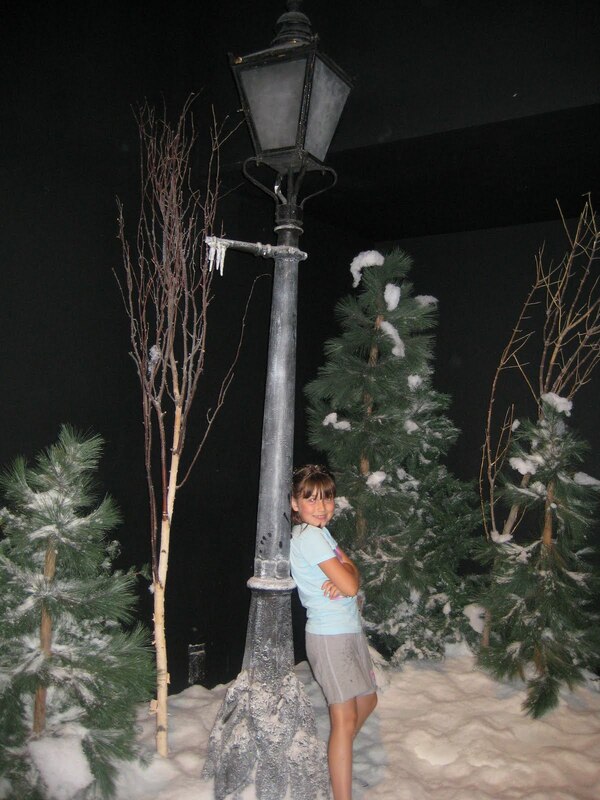 Yesterday Helena and I went to see The Chronicles of Narnia: The Exhibition. You can't really consider this post a plug, because, well, the exhibit ended yesterday. And on the whole, the exhibit was pretty lame (even the catapult was out of order), and admission prices were outrageously high. 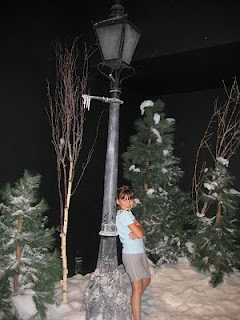 Also, this was not about Narnia as an imaginary land, or about the Narnia books (although a small stack of books in various language was on display); make no mistake about it: this exhibition is about the movie. One space was devoted to The Lion, The Witch, and the Wardrobe, and a smaller room focused on Prince Caspian. Throughout, a great number of monitors played clips from these films. If the show ever comes to your town, I can't say I recommend seeing it, unless you're a big fan of the movie, or deeply interested in costume and set design, or are deeply bored and don't know what to do with your money. On the other hand, as far as Helena's concerned (and, yes, me too), it was worth every penny to be able to step through the carved wardrobe doors and brush past a pile of fur coats to step out into a pine forest where snow blew down around us. The moment was magical (even though it came via Disney). Other highlights included sitting on a replica of the White Witch's throne (just because); touching the ice wall, which was painfully cold (the accompanying plaque was trying to impart something about climate change); and lifting a (safely encased) sword, just as a taste of what hard work it is, going to battle. I'm not absolutely certain of my facts, but I rather fancy it's Shakespeare — or, if not, it's some equally brainy lad — who says that it's always just when a chappie is feeling particularly top-hole, and more than usually braced with things in general that Fate sneaks up behind him with a bit of lead piping. There's no doubt the man's right. — from "Jeeves and the Unbidden Guest," in My Man Jeeves, by P.G. Wodehouse. It seems also to be true, as many people have decried before me, that P.G. Wodehouse is the perfect antidote to the blahs, a reading funk, or just a plain old bad day. I'm straight away downloading more Wodehouse to have on standby. 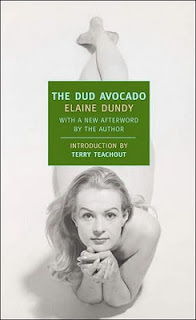 I wanted to say a little about The Dud Avocado, by Elaine Dundy, but time is tight these last couple weeks, so I keep waiting and waiting for time enough to say what I have to say, and it turns out I really don't know what to say, and if I wait any longer there won't be anything left for me to say, all that something I'm trying to put my finger on will have vanished into thin air, so here I am settling to say just a very little. It's charming!, delightful!, even outrageous! in its way. Groucho Marx, in a letter to Dundy, wrote, "I had to tell someone (and it might as well be you since you're the author) how much I enjoyed The Dud Avocado. It made me laugh, scream, and guffaw (which, incidentally, is a great name for a law firm)." Written in 1958, The Dud Avocado wreaks of other-era-ness, but in the best possible way. About a 21-year-old American girl living in Paris for a time (funded by her uncle), sowing her wild oats and trying to find herself. Somehow, magically, it's fresh. The thing that stands out for me, beyond the colourful characters and funny incidents, is the voice. And I don't just mean the tone, its easy, breezy way, the way the language simply carries you off, or the mood. I'm kind of assuming these are quasi-technical terms — voice, tone, mood — and I can't pretend to know how to use them correctly. But I mean: voice! It's so strong, I can hear it in my head, I don't mean like just some random crazy voice in my head, but really hear it, and if I were any good at that sort of thing (like in the way you need a certain vocabulary to be able to describe a really nice glass of wine — see, how lame is that, "really nice"? ), I could describe it, its timbre and pitch and fullness and legs, the way it cracks with occasional uncertainty and how it flirts. I mean: you can hear it! this beautiful narration, it's the most natural thing in the world. It's a voice with a touch of Irma la Douce about it; the stories share little (although, hmm... it's been ages since I saw that movie; I mean, the plots are different, but come to think of it, you could probably spot lots of similarities, situation by situation), but anyway the spirit of Paris is similarly resonant. Also it reminds me of Erica Jong's Fear of Flying, minus the psychoanalysis, and Breakfast at Tiffany's (more the film than the novella), but without quite that level of tragedy. She's a phony, but a real phony. And she's young! and in Paris! and in love! and oh, how terribly wrong it sometimes goes! And even though you want to slap her from time to time, really, deep down, you hope everything turns out for Sally Jay. I returned to the table black and blue, two buttons ripped off my blouse and mad as a wet hen. I confronted Larry. "Good-by," I said. "Go to hell and take this whole bunch with you. Do you know what I think? I think they should be driven into the sea with pitchforks, like a horde of great crab things." I gesticulated wildly, and my handbag swung out and hit something or somebody, and landed on the floor, butter-side down of course, and everything spilled out — lipstick, compact, passport, mirror. It was the Ritz all over again, except the gesture had popped the last button of my blouse as well. I stamped on the mirror in sheer temper. Then I sat down. I didn't know whether to laugh or cry. Everyone, I noticed, was very polite about my outburst, which for them was merely the next item of distraction which they expected to have provided; Larry picked up my bag, put all my things back in it, handed it to me and told me to go to the Ladies Room and have the attendant sew the buttons back on my blouse, and that we'd go on as soon as I got out. And then — oh gosh — I know all this next part by heart — I should, I've been over it so many times. And then I came out of the john and told Larry I'd lost my passport and he said, "No you haven't, here it is, I found it after you left" and he took it out of his jacket and slapped it against the palm of his hand a couple of times and asked me why on earth I carried it around with me. I said because I didn't know where to put it down. Oh Lord, just saying these words even now makes me groan with boredom, when I think how many times they've bounced off dead walls and deaf ears. Anyway, I said I didn't know where to put it down because I was always losing things, even in my hotel room, or they were losing me, rather. It's a gradual thing — I kind of slowly miss them — it's as if they're weaning themselves away from me. I've never known a fountain pen longer than a month and I'm lucky if a lipstick stays with me for three weeks. So, as I said, that was why I carried this passport around with me. Larry said, "O.K., O.K., it's none of my business," took my bag, dropped the passport in, clicked it shut, and handed it back to me. And that, as I was later to say about a hundred thousand million times, was the very last I ever saw of that passport. I bet you want to know what happened to that passport! Here's another little excerpt, which gives insight into the title. This book is a bit hard to find in Canada (I believe it's a matter of rights and permissions — there's not even a Canadian price printed on the cover), but it's worth going out of your way to get your hands on a copy. Wow, I had more to say than I thought. Beside the Sea, by Véronique Olmi, is an amazing little novella, simple and powerful. Recently available in English, several reviewers are raving about it (eg, 1, 2, 3). It's about a mother taking her two boys to the seaside, and from the start, something doesn't feel right. Why, for example, are they travelling by night? And Kevin is worried about missing school. Mother's planning for this ideal vacation is pretty half-baked — she doesn't seem to know where they're going, they're poorly packed (did they leave in a hurry? ), she just doesn't have much of a grip. Everything is going wrong and it's thoroughly disheartening. As the mother tells the story, we learn a little bit about her, but very little: she's afraid of talking to people, she's missing teeth, she goes to the free clinic. There's a social worker, there are meds. Money's tight. At first I thought she must be young, and quite simply overwhelmed by motherhood, but later I didn't think so, though maybe that's simply her weariness aging her beyond her years. Since I couldn't track down a copy of this book easily, I picked it up in the original French (Bord de mer). J'ai regardé par la fenêtre, on voyait rien. Moi j'ai l'habitude de donner sur les immeubles d'en face et j'aime ça, voir les gens bouger derrière les rideaux et toutes les petites lumières allumées quand le soir arrive, c'est beau et on est tous ensemble, bien rangés dans nos boîtes, c'est l'ordre des choses, ça me plaît. Là, on voyait rien, même pas des phares de voitures, un réverbère, rien. Qu'est-ce que ça donnerait en plein jour ? Qu'est-ce qu'il y avait derrière ma fenêtre ? La mer ? Non, j'entendais rien et puis un hôtel au bord de la mer ça aurait été trop cher, je me serais méfiée tout de suite. Alors ? Qu'est-ce qu'il y avait en face de moi que je voyais pas ? Le terminus des cars ? Un chantier avec des grues des camions et tout le tintouin, quelque chose qu'on construit ou qu'on démolit ? Je déteste ça, les maisons à moitiées arrachées, je supporte pas de voir la couleur des tapisseries de maisons à moitiées arrachées, y a rien de plus triste à mon goût. Fallait pas que je commence à imaginer, tout était possible derrière cette fenêtre, on pouvait s'attendre à tout, fallait laisser tomber, laisser tomber tout de suite avant de se faire des cauchemars. It turned out to be slow going for my far-from-fluent self, about 10 pages a day (and I think now this kind of slowdown was just what I needed), but the experience — as much as the book itself — has given me a lot to think about. I've been thinking about tone, and how it is that we glean what we do from what we read. Choice of words, their social register. Uneducated? Melodramatic? From grammar, how casual the tone, whether a character (or her thoughts) is care-free, sloppy, rigid, organized; from punctuation, how breathless and panicked, or slow and thoughtful. This is hard enough to do when reading in one's mother tongue — we process so much of this information subconsciously, it's hard to point to direct evidence for the conclusions we draw. In a second language, well, it's harder. I'm pretty proud of myself for getting what I did from this exercise, but my knowledge of French grammar is piss-poor, and it turns out my vocabulary's pretty limited too. And then there's the fact that I filter it all through my knowledge of English-language writing conventions, which don't necessarily apply. On top of this, my entire reading is coloured by my preconceptions of the material. For all that, I did come away with some very strong impressions — of the characters and story, and favorable of the book as a whole as an intense and provocative read — but I can't say how true they are. (I'm curious to try this book in English someday.) I do look forward to tackling the second Olmi novella in my French volume. Cheer up, my little avocado! We looked at the menu. "Hah! Avocados," he said, brightening. "How I love them. Cheer up, my little avocado," he said to me pinching my hand. "You know, these American girls are just like avocados. What do you think, am I right, Max? Who ever even heard of an avocado sixty years ago? Yes, that's what we're growing nowadays." His avocado arrived and he looked at it lovingly. "The Typical American Girl," he said, addressing it. "A hard center with the tender meat all wrapped up in a shiny casing." He began eating it. "How I love them," he murmured greedily. "So green — so eternally green." He winked at me. "No, it's true. And I will tell you something really extraordinary, mes enfants. Do you know that you can take the stones of these luscious fruits, put them in water — just plain water, mind you — anywhere, any place in the world, and in three months up comes a sturdy little plant full of green leaves? That is their sturdy little souls bursting into bloom," he finished off, well satisfied with his analogy. "Well, this one isn't going to burst into bloom, " I said morosely, putting my nose in my drink. "What you've got here is a dead one." "A what? A dud one?" I took my face out of the glass. "No, dead. Dead. Oh, forget it." Max raised his glass and smiled at me. "The dud avocado," he said, proposing the toast. — from The Dud Avocado, by Elaine Dundy. Il m'a pas répondu. Il était barré quelque part, il sait bien faire ça, Stan, larguer les amarres — c'est pas mon môme pour rien. La maîtresse lui prête des livres et quand il lit c'est pareil : il nous quitte. Des fois je crois qu'il continue à lire ses livres, quand il les a rendus il y pense encore, il lit même sans les mots, il est vraiment très fort pour être ailleurs. — Bord de mer, Véronique Olmi. The Unit, by Ninni Holmqvist, is a sharp little dystopian novel with loads to say about some really important matters. Dorrit Weger has just turned 50 and moves into the Unit. She's given up her house (or it's been taken away), so she can live here in relative luxury, on the taxpayer's dime. She has no children, but she misses her dog. She is here to perform her civic duty. It's revealed in the early pages (and in most descriptions of the book), that the institution which is her new home is the Second Reserve Bank Unit for biological material. I'll leave you to figure out what that means. As compliant and accepting of her fate as Dorrit is, the program is not exactly voluntary; it's a government program that was initiated after years of public debates and democratic votes. Usefulness. The society in The Unit could be taken as a kind of socialism taken to an extreme. Everyone must contribute to the greater good, but the worth of individual contributions must be weighed against each other, and that's where it gets dicey. What would ever make a person dispensable? I don't think my job is important enough for me to make the cut. Authenticity. Maybe because this is on my mind, reading it fresh on the heels of Remainder. There are cameras everywhere, the awareness of which give every action a meta-action. It's not clear how much of what seems to be is real. It's not clear whether it matters. "I wasn't completely sure that this was actually true, for real, but the main thing was that if felt that way." But then there's the garden, Monet's garden, which is exactly the same as Monet's garden, but it's not. Motherhood. There's a passage regarding the subject of motherhood that made me cry. (Me! Cry!) About that veil that falls between a pregnant woman and the rest of the world, each side feeling pushed out by the other. And not till you're on the pregnant side do you totally understand it, and understand how little control you have over it. As if there's a genetic necessity for your world to be centred elsewhere. Love. The big irony is that for many inhabitants, many of them social misfits (what else would you call these artists, these free spirits?) all their lives till now, the Unit provides a sense of belonging, and strange and beautiful friendships are forged. Dorrit had never found love on the outside — not the kind that this society values anyway. Her love for her dog, or for her sister, are deemed less worthy. Art. It's no accident that the Unit is home to a high proportion of artists, writers. Clearly, they are not useful to society in any meaningful way. Also, they can, and are encouraged to, continue to practice their art on the inside; in this way it is regarded as something of a hobby, to do in your spare time, but it's hinted that the state is also able to profit from it. There are also librarians, gardeners, and intellectuals. "People who read books tend to be dispensable. Extremely." I was watching her as she talked, her green eyes exuding a sense of calm and harmony. But at the outer corner of one eye a tiny nerve was vibrating, almost imperceptibly; it twitched and quivered beneath the skin. This quivering, together with just the tiniest hint of tension around her mouth, was the only thing that gave away the fact that this harmony was not complete, that there was something inside that was not calm, and I was seized by an almost irresistible urge to put my arms around her, to console and protect. To try to save her. But just as during our nighttime stroll in Monet's garden a week ago, I was afraid I would ruin the atmosphere if I gave in to my emotions and impulses. Some readers found the prose dull, but I found it easy. The dry, matter-of-fact tone is in keeping with Dorrit's attitude; the whole story is imbued with her ennui, and I found it highly effective. Around four, I offered to tour Cornelia through my record collection. Part of me didn't want to play her any music, instead I wanted her to see how merely possessing all those albums was its own satisfaction, to know that they were there. The collector's joy. There'd been a time when I knew every recording of every piece, the sign of a specialist who understands very little. But now to gaze upon the sleeves, to not play them. To be in awe. I wanted her to use silence to appreciate that, in comparison, the experience of listening was a lot more personal and complicated: how it depended on the day's mood, the temperature of the air, what clothes you were wearing and how they felt, what you'd eaten for lunch, and then of course the equipment and the tones it produced and at what volume, and every associated emotion and memory brought by the listener. Never mind the music. The experience of music was so different for each individual, it wasn't even worth discussing. As soon as I pressed PLAY, we may as well have existed in separate dimensions. 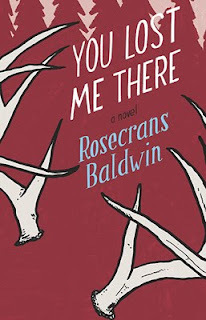 You Lost Me There is the debut novel by Rosecrans Baldwin, cofounder of The Morning News. It starts off light — with a light touch, light-hearted. And while it maintains a casual tone, you end up exploring some relatively meaningful emotional and philosophical questions. The narrator is an Alzheimer's researcher, so he has a scientific idea of how memory works, but this gets put through the wringer as he works through his own memories on an emotional level, particularly as many of those memories are in stark contrast to those of his late wife, killed in a car crash, who left behind some index cards documenting a very different take on events they had shared. I think about that kind of thing a lot, like how some very vivid memories of mine must figure as insignificant blips in the minds of some of the characters who've passed through my life. Or like how my mother has composite memories, of that one time, that as I understand as a patchwork of what I remember as a number of discrete events. Not that my opinion much matters on these points, but the title and the cover do nothing for me. What made me take notice was the author's name (I love the Tournament of Books! ), and then it was the plot summary that hooked me. But I would not have picked up this book on the basis of its packaging. Nothing about it holds any appeal for me — the colour, the font, the antlers. Halfway through the book I was still wondering what's with the antlers (actually, for the first half, I didn't even identify them as antlers, I was seeing more along the lines of tree-branch hands), and even while antlers do ultimately figure in the story, and even as part of a climactic scene, I don't think they play a vital enough role to be the visual motif to carry the book. But, hey, what do I know, I'm no book jacket designer. The title I simply don't connect with, even after having read the book; it's actually kind of clever, if I think about it, in an appropriately casual way, but I'm not sure I should have to think about it. But, really, thank you very much, Penguin Canada, for sending me a review copy, because it turned out to be a very charming and thoughtful book, an enjoyable reading experience, and I doubt I would've got around to this book otherwise, and all in all I'm rather glad that I did. There's something easy about this book — easygoing? Like when you dread going to a dinner party, but then you go and there's someone you never met before who just puts you totally at ease, you really hit it off, someone who is charming and interesting, and spirals a little bit out of control as the party goes deep into the night, but you've kind of bonded by this point and you're totally sympathetic, so you see each other through till morning, and you probably won't ever see each other again and that's OK, and you're really glad you went. That's what this book felt like. Forgive my rambling, but it's a couple weeks now since I finished reading it, and my memory of it shaky as far as the objective facts of it go. But the feeling of it is still there. I heartily recommend this book. (Certainly I liked it much better than that other book, by a big-name author, about a scientist, his identity issues and relationship foibles; and it's funnier by far.) You Lost Me There is perfect for a late summer's day while you sit in your garden chair and drink too much wine. Just enjoy it. I'm having a hard time carving out some time to write in any reflective kind of way. I've been back from away for days, but tired, stressed, and busy. And I finished reading The Passage (all 800+ pages!). The pacing is good, and the characters are (mostly) believable, and ohmygod postapocalyptic biofreak vampires! so it's a good summer read, or long train ride read, or stormy night read, or snowbound winter cabin read (I'm guessing). I'll definitely be reading whatever books follow this one in the series, and I'll probably even see the movie. I saw some clip of an interview with author Justin Cronin in which he discusses the book's genesis and the tradition he sees it following, being somewhat epic adventure, like, for example, Jules Verne (or am I confusing this with the China Miéville interview I saw? or was that element common to both? ), but it's got me wondering, what kind of book is this really?, it's not exactly literary, but it's a far cry "better" than many a blockbuster à la Dan Brown (but how? by what objective criteria? ), and I'd like to think this book will be read and enjoyed 100 years from now, maybe not as the cream of the literary crop, and not as some obscure gem, but as something people, real people, read and enjoyed, and it's pretty good dammit, and I wonder is this, say, Dumas-calibre? I mean: an adventure story! with heroes and villains and moral ambivalence and romance! The vampires, I'll point out, are wholly original vampires, and I shouldn't even call them that — they're referred to as "virals." They are the result of biogenetic manipulation gone wrong, and have no relation to Vlad the Impaler and myths of that ilk, barring a few superficial similarities (but virals love garlic — you can set traps with it). I think Cronin owes a lot to Anne Rice (will people read Anne Rice 100 years from now? ), actually, in terms of the vampire/viral sense of "family" and their manner of connection/communication. There was only one expedition to a bookstore while we were away (I shouldn't call it that. Really, it was an expedition to get mommy an espresso-based beverage, the site of which caffeine-proffering establishment is on the premises of a bookstore, so I had to take a gander...), and I picked up only something for the kid, In a Dark, Dark Room and Other Scary Stories, by Alvin Schwartz, which was a big hit, in particular the story of "The Green Ribbon." Helena's reading skills are better in French than in English, so it's a coup for me, a huge relief, to find something that both involves and challenges her in a language I can more easily relate to her in. 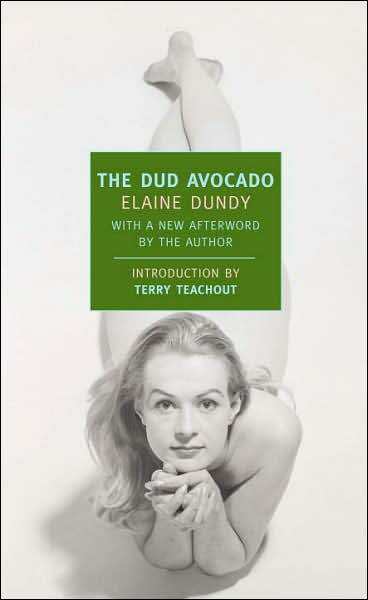 My sister was lovely enough to bring me The Dud Avocado, by Elaine Dundy, which I've been wanting for ages, but then my daughter was careless enough (but no, it's not her fault, it's an accident of circumstance) to set a sopping wet paper towel beside it on the table on which it was resting, so the back third of it now is pretty severely warped, and this made me sad and angry, but I'm past it, it's still the same book I want to read, with all the same words, all still legible, a beautiful book, it's what's on the inside that counts.